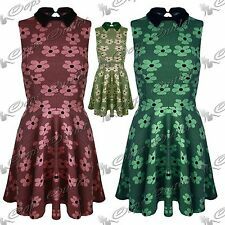 Size 12 Skater Dress Cats Casual Everyday Weekend Party Smart Shirt Collar Thanks for looking. Please check out my other items. Oasis Smart Collared Lace Dress size 8. Condition is Used with a small button resewn at the collar which is mostly covered by the collar when worn(pictured). Comes from a smoke & pet free home. Dispatched with Royal Mail 2nd Class. 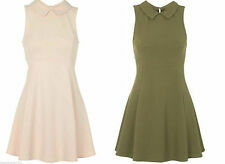 50's style swing dress with Peter Pan collar. Skater Dress. Polyester Chiffon. Navy with Red Collar. Beautiful skater dress Sleeveless Close up shows floral pattern of the dress Individual beading on the collar George Size 16 Black Skater Dress with White Collar. Condition is Used. Dispatched with Royal Mail 2nd Class. 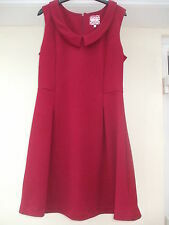 BNWT Lindy Bop Retro Maroon Swing Dress with Black Collar Detail, UK Size 12. 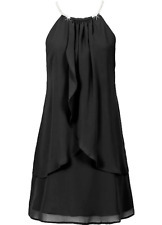 Fabulous style dress, great with a black shrug, heels and bag. Ideal for the 50's look. Lovely item. Swallow Print Skater Dress. Condition is Used. Dispatched with Royal Mail 2nd Class. Short / mini length. Left breast pocket. Left hand zip for easy dressing. Black contrast collared neckline. Black Lace Lined Cut Out Back Skater Dress. Party Goth. Condition is Used. There is an adorable little Peter Pan collar and a back zip. The out is in a lovely lacey fabric with a full lining. A cute little black dress. Chi Chi London Navy Collared Dress - Size 10 NEW. Gorgeous dress - great condition, only worn once! RRP- around £50/£60 Miss Patina Pearl Collar Printed Dress - Size 12. Condition is Used. Dispatched with Royal Mail 1st Class. This dress was a present and has never been worn as can be seen from the spare button still being attached. It's 37" long and is made from 90% polyamide and 10% elastane. Womens Size 8 Missguided Black Sleeveless Contrast Collared Skater Dress New. Condition is New with tags. Dispatched with Royal Mail 2nd Class. Beautiful blue tartan pleated dress by Hell Bunny 💙. Featuring a retro inspired collar & fixed bow 💙 Zip fastening 💙. Zara Trafaluc Robot Print Skater dress. Size small - uk 8-10. Very cute print. Dress Sleeveless Size. Very unique looking, will make a perfect addition to your wardrobe. Lovely collar and square silver colour buttons. Retro Style Floral Orange Swing Dress With Collar . Condition is Used. Dispatched with Royal Mail 1st Class. Dress has small defect wear hem has come undone at the back of the collar, see picture. Apart from this the dress is in perfect condition. Bright vibrant dress, perfect for summer. Lovely style. in good condition. Polka dot chiffon top. Material Composition: 100% Polyester (Top), 97% Cotton, 3% Elastane (Skirt). FlatteringPeter Pan collar. Cute bow detail to waistband. The skirt is a full circle, giving plenty of swing, and a fabric covered belt completes the look. The dress is fully lined. Condition; In excellent, minimal wear condition. A fabulous dress, enjoy!